Travel guides insist that if you are taking a trip to Taiwan that one of the MUSTS on any travellers itinerary should be an evening at the Keelung Miaokou Night Market (廟口夜市) which is well-known for its diversity of Taiwanese delicacies and being so close to the sea - it's fresh selection of seafood dishes. The night market is jam-packed with Taiwanese and foreigners walking shoulder-to-shoulder every night of the week and it truly is a purely Taiwanese experience that shouldn't be missed while visiting the country. Most people however are unaware that the name "Miaokou" (廟口) refers to a 'temple front' and that the popularity of the night market today is directly related to the importance of the temple from which the night market ultimately became an extension. Today, whenever there is a temple celebration the festive carnival-like atmosphere brings with it countless number of visitors as well as vendors who set up shop and aim to feed the masses. If you visit ANY temple celebration in Taiwan, the vendors won't be far away and it is always easy to find something delicious. In the past this was also true of temple celebrations, but temples also tended to be more of a focal point of towns and cities and businesses always wanted to be as close as possible to a temple for both economic and superstitious reasons. The Miaokou night market we see today is a direct result of this type of phenomenon as well as some pretty great urban planning that allowed the night market to become a permanent and very organized tourist attraction in the heart of Keelung's downtown core. The temple that sits within the heart of the night market is named Dianji Temple (奠濟宮) and is separated from the hustle and bustle only by a giant ornate open temple gate that automatically gives the impression that the temple inside is a sight to be seen! 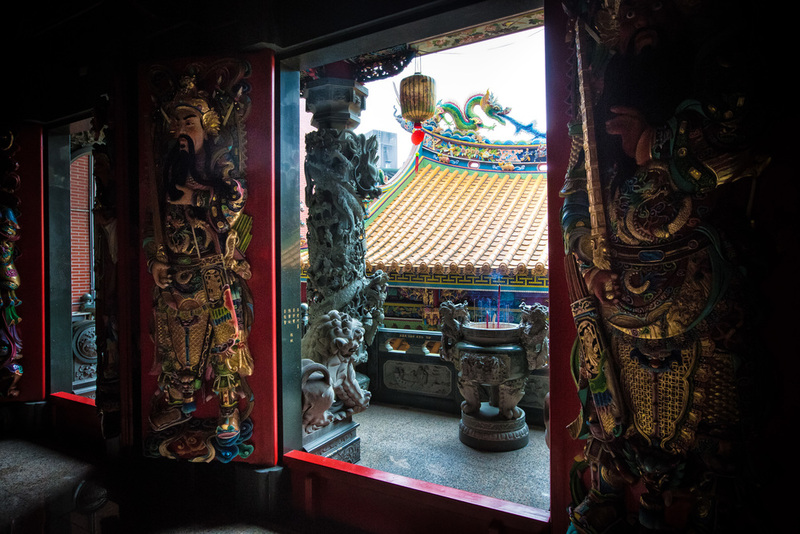 The temple is the largest of the 'big three temples' of Keelung (基隆三大廟) which also includes the City God Temple (城隍廟) and Ching-An Temple (慶安宮) all of which are Taoist, a short walking distance from each other as well as a short distance from the harbour showing the significance of the harbour to the early settlers of the city. The temple was established in 1875 after a generous land donation by a wealthy local merchant and was built on the site of an older shrine to the Water God (水仙尊王). In 1923 the main shrine was completed and is dedicated to the Sage King Kaizhang (開漳聖王) otherwise known as Duke Chen (陳元光) a Hoklo (閩南) folklore hero from Fujian province in China who died in 722 and who is worshipped today by the Hoklo people for his loyalty (忠義之神) and also for his role in developing a Fujian province (福建省) in southern China (where most of Taiwan's early immigrations came from). The main hall of the temple was originally finished in 1923 but was unfortunately short lived due to allied bombing of Keelung harbour in 1940. Keelung was an important staging point for the Japanese imperial navy and the city was high easily during the American advance toward mainland Japan. Reconstruction work began on the temple in 1957 lasting until 1964. In 1998 the temple initiated a five year expansion plan to build a more impressive rear hall with several different floors. If you visit the temple today the main shrine room is dedicated to the Sage King Kaizhang with offices to the side. Behind the main shrine is a really cool looking shrine to the Water God who is in the form of Yu the Great (大禹) an emperor from the Xia Dynasty (夏朝) who was celebrated for his knowledge of irrigation and flood control. Interestingly children who are brought up in Taiwan are very familiar with Yu the Great as they are taught rhymes and stories (大禹治水) about him in their Chinese classes to teach about wisdom, perseverance and hard work. The second floor shrine is dedicated to Marshal Tian Du (田都元帥) another historical figure from the Tang Dynasty (唐代) whose actual name was Lei Hai-Qing (雷海青) and is important to artists, musicians and performers. It is quite common in Taiwan that Taiwanese Opera performers will pay respects to him before a big show. 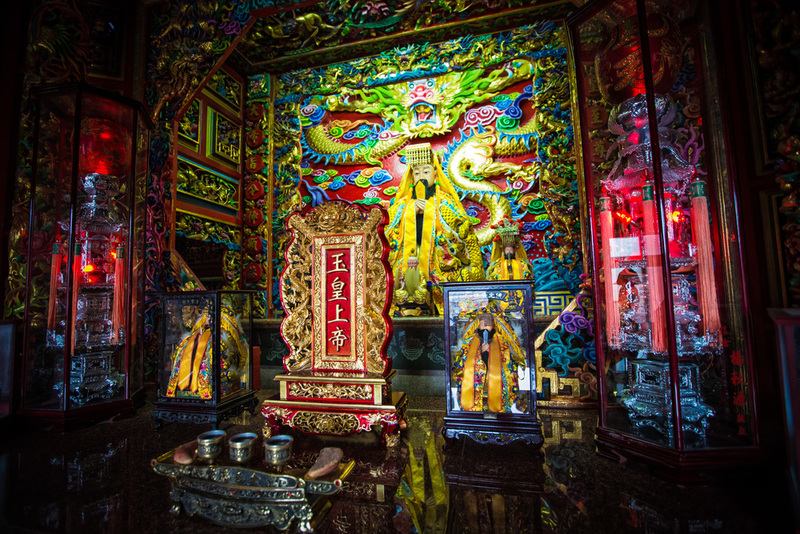 As with most multi-level Taoist temples, the highest floor of the temple is dedicated to the Jade Emperor (玉皇大帝) who is the most important of all the Taoist gods and presides over heaven. 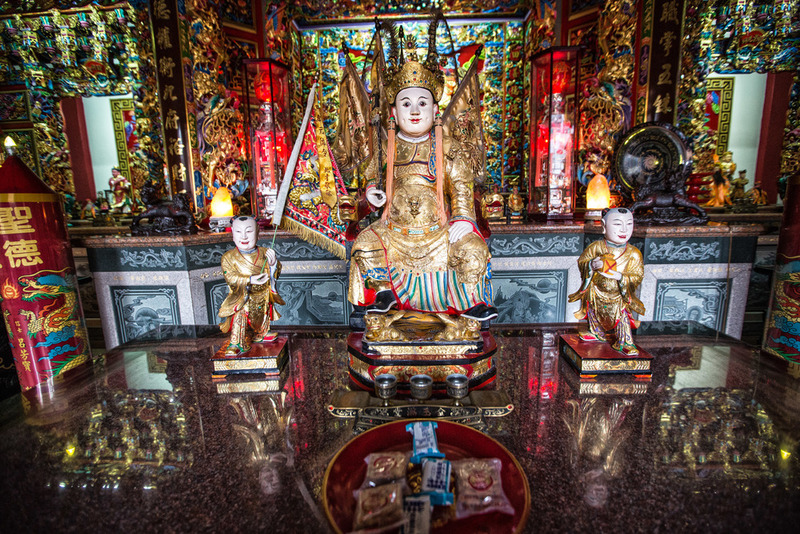 Statues of the Jade Emperor always look pretty cool but I actually prefer the Taoist gods who represent the underworld like the City God or the Qingshan King whose purpose is to judge people based on their actions. 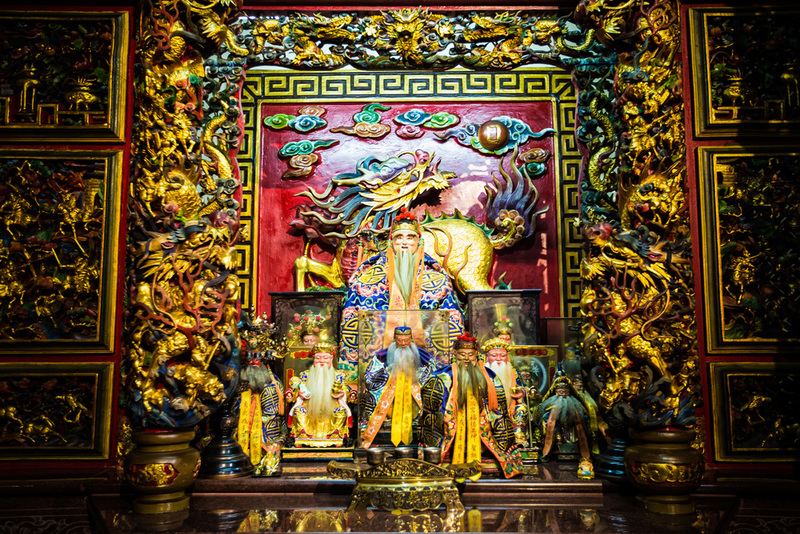 Apart from the main shrines on each floor there are also shrines in the rooms dedicated to the Goddess Mazu (天上馬祖), Master Pure-Yang (純陽祖師) otherwise known as the Tang Dynasty poet Lu Dongbin (呂洞賓), The master carpenter Lu Ban (魯班/荷葉先師), Marshal Guanyu (關聖大帝), The God of Literature (文昌大帝), The Earth God (土地公/福德正神), Star Lord Tai Sui (太歲星君) and the God of Wealth (財神) as well as other historical figures of which there are too many to name! One of the important things to notice at Dianji if you are a random traveller is that while the temple does feature stone carvings of dragons, phoenixes and other mystical creatures you are also able to see colourful fish, crabs and other sea life carved onto the walls. 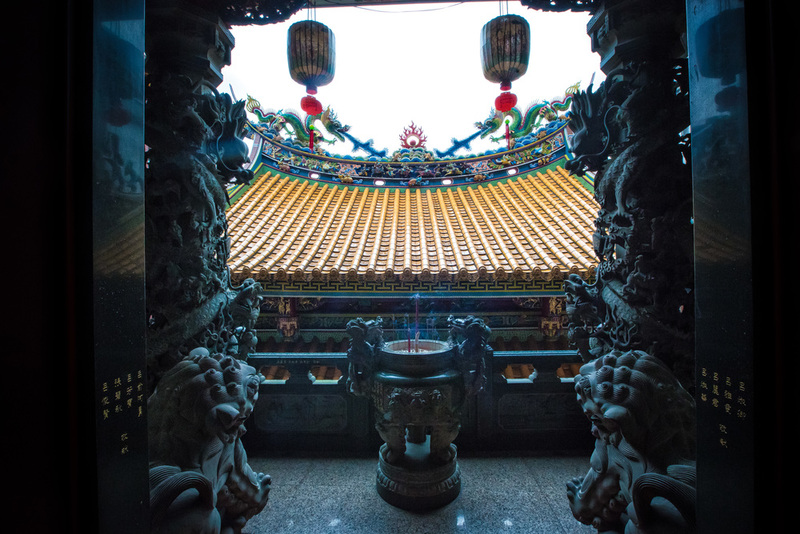 This is significant because of the importance of the temple, it's location next to the sea and pays homage to the seafaring ways of the residents of Keelung. The temple tends to be quite busy on weekends, during festivals and also during Ghost Month when the entire city of Keelung becomes extremely busy. During the week it's quite easy to walk into the temple and be able to casually look around without crowds of people getting in your way. The important thing when you visit this temple (and any temple for that matter) is the pay close attention to the details on the walls. 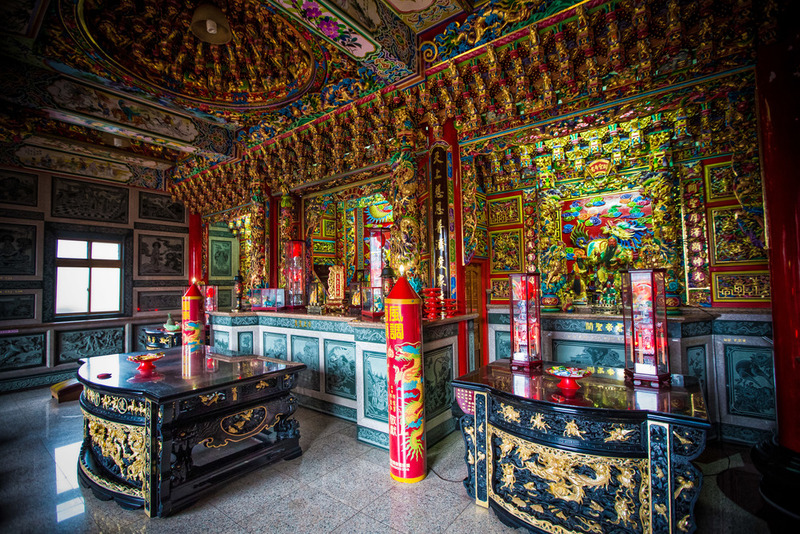 The Taiwanese artisans that worked to put the temple together had extreme cases of OCD and the symbolism in all of the imagery deserves a bit of your time. I'm going to continue with blogs from Keelung over the next week or two with posts from the Miaokou night market as a continuation of my "People of the Night" series (which was put on hold for a while). 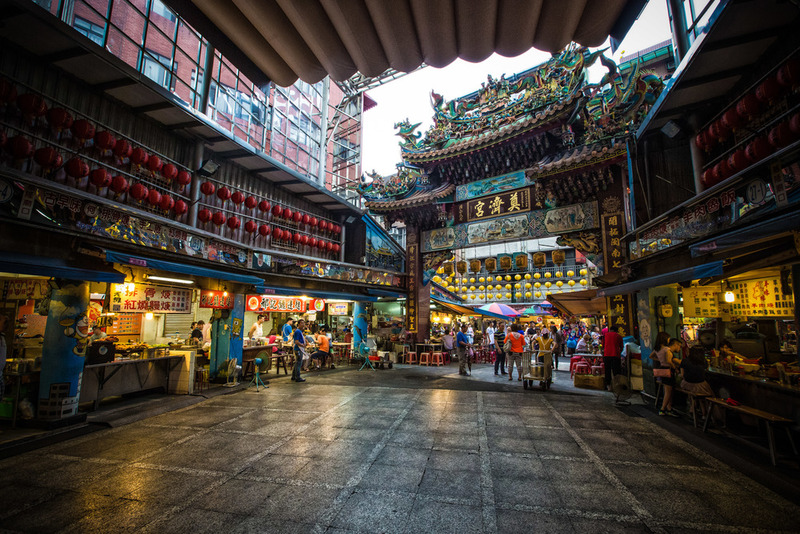 This temple and the night market really are must visits if you're on a visit to Taiwan - So just jump on a train and head to Keelung to check out both!